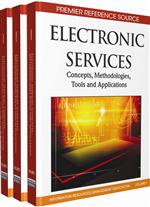 This chapter examines the provision and codevelopment of electronic services, content, and applications at the conceptual level. There is focus on the provision of services electronically (e-services) and the development of user-produced electronic content and applications (nonservices). The chapter points at codifiability, digitization, and interpretation as three crucial conditions for the development of e-services and nonservices. Codifiability is the basic prerequisite, but even if knowledge is codifiable, it does not necessarily follow that it can be entirely digitized or that it will be interpreted in the same manner in different contexts. Regarding implications, an important issue is whether the development of e-services and nonservices leads to specialization and/or convergence in the production and marketing of informational services. Is there reason to anticipate that the production and marketing of informational services will develop differently from other production areas with respect to the implications of technology on the combination of specialization and convergence?